What does it take for local digital collaboration and sharing to work? CLGdotTV content - about, for and by anyone involved in the provision of local public services - is free to view. Help us make sure that it stays that way. Click the yellow SUPPORT US button top right of this page. It’s your Channel after all. MHCLG’s Paul Maltby on appeared in CLGdotTV at the end of September to explain the new £7.5m Local Digital Fund and its hoped for outcomes. Expressions of interest will be evaluated by the Local Digital team and be ‘clustered’ with similar applications around common issues. Successful EoIs will apply for funding between 15 October and 18 November, and decisions will be announced on 3 December. Guy Giles, a veteran of the e-government programme of the early noughties says the Local Digital Fund stimulus is ‘long overdue’. Based on his experience with innovation agency Looking Local (part owned by Kirklees Council), he has learned the ‘rule of 20’ for new product development in the sector – that a minimum of 20 users/collaborators are needed to launch a sustainable new product for local councils. This is because, notwithstanding that council user and provider needs are very similar, products need to be supported for a vast array of different systems used by councils and this cost needs to be spread across a significant number of users. Hilary Simpson, who worked on tech innovation within front-line services at Camden Council, describes some of the challenges even a well-digitally-resourced council can have in supporting the sharing of a new developments with another authority. Will options emerge for less well-resourced councils, she asks, and will the Fund be able to support other models of sharing and amplification involving, for example, SME providers? We will be able to ask these questions when we catch up with the LD Fund again on 31 October at Digitech18 in Leeds, where we will be recording a series of programmes from the event. An Audience with CLGdotTV takes place six times a year. 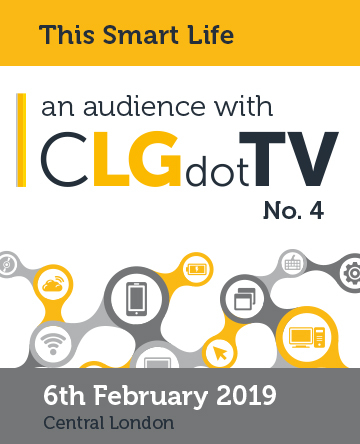 We invite a studio audience of around 40 to join us in the NESTA building, five minutes walk from London Blackfriars station and make five or six CLGdotTV programmes. There are no power-points and the questions and interventions from the floor are as authoritative and useful as what the panellists have to say. Each programme is broadcast on CLGdotTV. Plus we edit a 30-40 minute video summary of the day’s conversations with clips from all the discussions. Each month we get around 13,000 views of our video programmes on our own platforms. Our sponsors get many more on their platforms. In July 2018 we started to publish our content as podcasts simultaneous with the video broadcasts. We are now getting more than 600 people a month listening in. Pushing on with integration. Smart thinking, smart solutions and smart technologies to do health and social care faster, cheaper and more sustainably. Smart living, smart lives, smart places, smart futures, smart everyone, smart everywhere, smart democracy, smart governance and the liveable life. The Internet of Better. Smart and local economy. Changing behaviours and informing choices in a smart age. Planning, the built environment, infrastructure, post-industrial smart, physical security and de-stressing society in a smart age. Building the circular economy, living with a lighter environmental footprint, smart technology and machine learning in the race to row back from the brink. A seat in the studio, in the audience or on one of the panels, is by invitation. Guests can come for an hour and join in making a single programme or come for the day and star in the lot. It all happens at 58 Victoria Embankment (the NESTA building) five minutes walk from London Blackfriars Station. Cameras are rolling by 10.30am and it's all over by 4.30pm. Lunch and refreshments? Of course. But let’s be frank, it’s the quality of the brain food not the sandwiches that make all this un-missable.